Ricotta is a soft, moist, fragile Italian curd cheese made from whey (left over from making hard cheese). Ricotta means “cooked twice” or “re-cooked” First, the milk is heated during hard cheese production and then the separated whey is collected and re-heated to make ricotta curd cheese. The whey is heated to near boiling point, with a little vinegar (or sour milk, lemon juice, olive oil) to raise the acidity and cause coagulation. The curds rise to the surface in tiny lumps and are scooped into open-weave baskets or plastic moulds where they are left to drain for 4-6 hours, then they are ready for consumption. 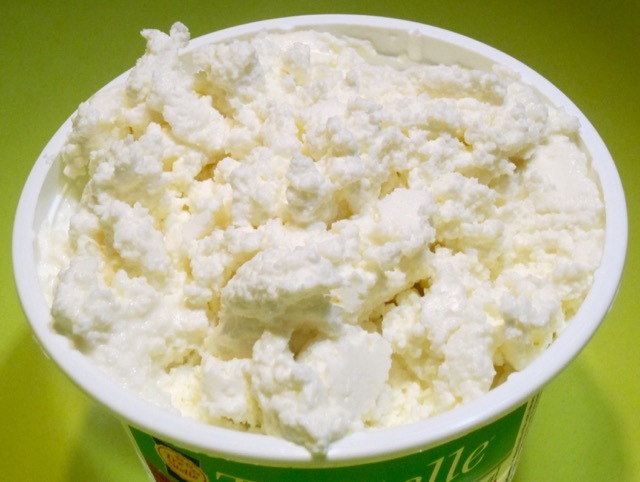 A gallon (4.5 litres) of whey will yield only a few ounces of curd, which make up the ricotta cheese. Appearance: Fresh Ricotta curd is creamy white in colour, moist to semi moist, with fragile tiny lumps, and a spreadable, grainy texture, which is smoother than cottage cheese. It’s high in protein and calcium but low in fat (around 13% or less). The cheese is highly perishable. Flavour: slightly sweet in taste, with a light milky flavour and aromatic lemony notes. Storage: keep refrigerated and consume by the use-by date. American Ricottas are typically made with fat-free, skim or whole cow’s milk, sometimes combined with whey. This produces a wetter, creamier style of ricotta than the naturally sweet Italian versions. It’s available in whole-milk, part-skim and fat-free versions. The part skim has about 40% less fat than the whole-milk version. Ricotta is also commonly used in savory dishes, like pasta, calzone pizza, manicotti, lasagna, and as a stuffing in ravioli. It can also be combined with cooked spinach to stuff pancakes and cannelloni, or to stuff pastries. It also forms the base of a range of pasta sauces. It’s a favorite component of many desserts, such as cheesecakes, mousse, ice-cream, cannoli bites and tarts. It’s often served, in Italy, with chocolate shavings or cinnamon as a simple dessert. It also makes a suitable substitute for mayonnaise in egg and tuna salad, or a substitute for paneer in the Indian dessert Ras Malai. Fresh ricotta cheese has a very perishable but it can be subjected to extra processing to produce variants, which have a much longer shelf life. These production methods include salting, baking, smoking and fermentation. Examples are: Ricotta salata, Ricotta infornata, Ricotta affumicata and Ricotta forte. Me too. I used it to make an awesome lasagna over the weekend! Have a lovely week!